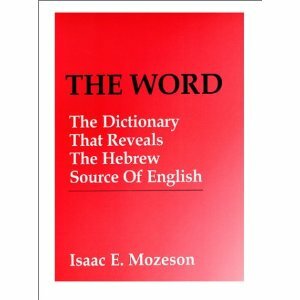 Expert Review of THE WORD: The Dictionary That Reveals the Hebrew Source of English by Isaac E. Mozeson, one of our picks of the top Jewish books for kids! This landmark dictionary proves that English words can be traced back to the universal, original language, Biblical Hebrew. "Genesis II" supports a 'Mother Tongue' thesis, and the Bible also claims that Adam named the animals. This may seem difficult to accept, but then why do the translations of the following animals' names: Skunk, Gopher, Giraffe and Horse actually have corresponding meanings in Biblical Hebrew, such as: Stinker, Digger, Neck and Plower! The book features overwhelming data suggesting that the roots of all human words are universal, and that words have related synonyms and antonyms that must have been intelligently designed (perhaps by the designer of life himself!) The current hypothesis that language evolved from grunting ape-men may seem like the flat earth theory after reading this book. The 22,000 English-Hebrew links provide surprising evidence, and open new worlds of understanding, once we consider that all of these similar words could not be coincidences.